Linda Laws, Richard Raymond, Nancy Maleske, Bill Maleske brave the cold! 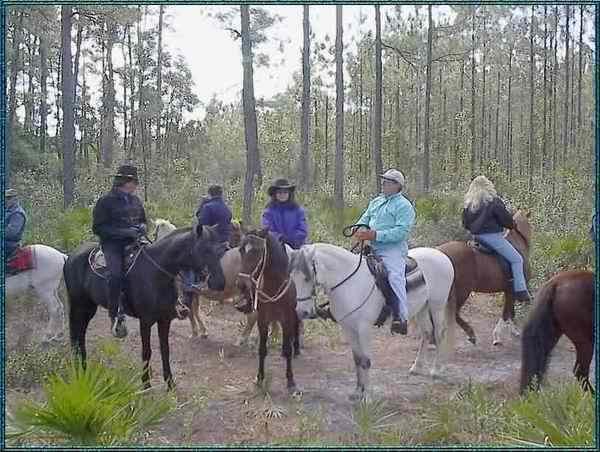 Brave souls Nancy & Bill Maleske with cousin Mary, Linda Laws, Joe & Pauline Piazza, Carol & Al Perez, &Richard Raymond braved some cold morning temperatures to meet at the Perez's "Feeling Good Corral" and ride into the Ocala National Forest. 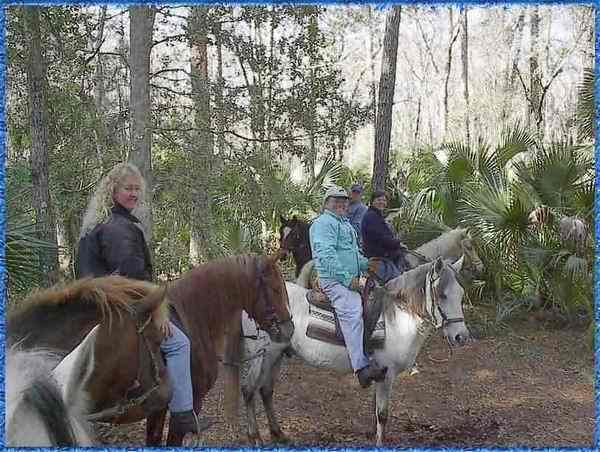 The day warmed up nicely, the horses were charged with energy (not enough to go through a large creek though) and we saw natural Florida at its best. We returned to Al & Carol's for a great bar-b-que and great conversations and friendships. Woosies who stayed home missed out! We are looking into a summer party at the Horseshoe Lake Cabins. They have a beach, rental boats, and beautiful trails through the property. We will let you know the exact date. You will be able to bring your whole family and the kids can swim, fish, or boat while some ride and we will have a big bar-b-que. You can see this beautiful place at www.horseshoelakecabins.com!